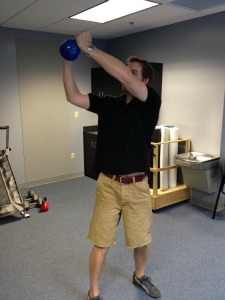 Need more variety in your golf weight training routine? Kettlebell workouts are a great way to further progress strength training, and mix things up if your body is getting used to performing the same motions over and over again. This page will expand on my other kettlebell exercises pages, and will provide you with more specific ideas and areas to target. If you are new to the world of kettlebell workouts, I would strongly advise starting out on my Kettlebell Exercises for beginners page in order to more familiarize yourself. 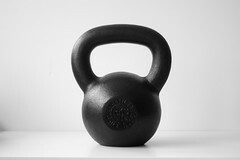 Also, that page will provide some of the more basic kettlebell exercises that you may find more appropriate initially. If you are familiar with kettlebells, than keep reading! 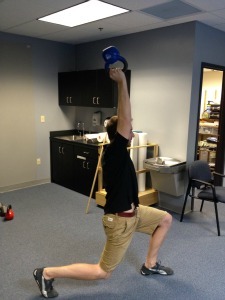 And remember: Kettlebell workouts are complicated motions but are intended to be performed very smoothly! Jerky motions will only increase risk of injury. If you can't perform the motion smoothly at first, practice without the weight until you feel more comfortable. -For this exercise, you will need two bells of equal weight. To pick them up, squat down and grab the handles and then quickly stand up. -When you stand, drive forward with your hips to increase momentum (similar to a kettlebell swing, and lift the bells up to your shoulders by bending your elbows. -Your palms should be rotated inwards, and wrists extended, so that the weight is resting against the outside of your biceps. -Now, perform a very deep squat, lowering your buttocks towards the floor. Stand up by pushing through your heels and repeat. -Preferably use a heavier weight since you will be holding it with both hands. Grab the weight and hold it by the handle high on your chest and perform a deep squat, where the back of your thighs come in contact with your calves at the bottom. Repeat! -Grab the kettlebell and bring it to your shoulder by flexing your elbow, keeping the weighted end pointing towards the ceiling. -Next, elevate the weight straight overhead, locking your elbow. -Maintain this position, and perform a traditional lunge. You may only be able to perform a handful of lunges before you will need to lower the weight. Repeat for the other side. 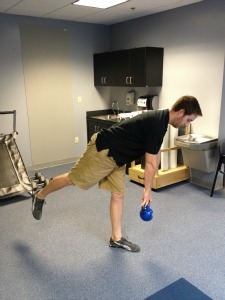 -Start standing with the kettlebell on the floor by your right foot. Squat low and grasp the handle with both hands. -Quickly stand up, and at the same time lift the kettlebell up and to the left with both hands, finishing with your arms fully extended. 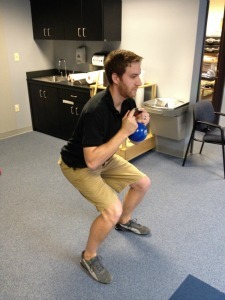 -Squat again, lowering the weight back down and to the right. Be sure to perform to each side. -Grab the kettlebell by the handle with both hands, and hold it in front of your with your arms relaxed. -Slowly bend forward at your waist, remembering to keep both your low back and your knees as straight as can be! -Lower the weight to as close to the ground as possible, and slowly return to the starting position. -For more of a challenge, balance on one leg and perform the same motion. Then repeat to the other side. If these kettlebell workouts aren't enough, please check out my other kettlebell pages for more great exercises!